Journey along Alaska’s only National Scenic Byway and take a trip into the historic town of Seward. Once in Seward, take the opportunity to visit the Alaska Sea Life Center—Alaska’s only public aquarium and world-class cold-water marine research facility. Visitors to this “window on the sea” have close encounters with puffins, octopus, sea lions and other marine life while peeking over the shoulders of ocean scientists studying Alaska’s rich seas and diverse sea life. Nearly 2,000 invertebrates, fish, seabirds, and marine mammals are on exhibit, including puffins, seals, starfish, and various seabirds. 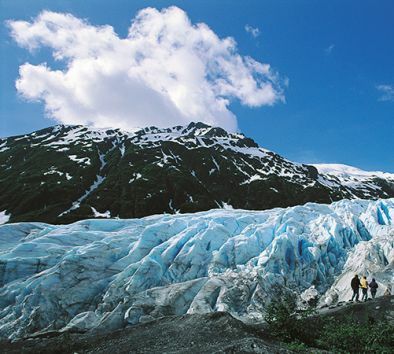 Your lodge team will provide information on these and other optional activities, such as a side trip to Exit Glacier—one of the more accessible glaciers in Alaska, or a two-mile ride on an Iditarod dog sled. Admissions to the venues in Seward are optional and can be booked through our tour desk. Travel time is approximately 1 hour each way.